This has been at the top of my list for nearly a year, a barely legible scratch of pencil on a half-sheet of printer paper: make onion dip. In my mind the task was straight-forward - do an onion dip make-over, a version that doesn't require ripping open a packet of soup mix. As a kid my grandma would often whip up bowl of onion dip before we would visit her house. She would serve it alongside a bowl of corn chips, and I suppose this is where my taste for it developed. I decided to do a grown-up version here by using lots of deeply caramelized onions along with a Greek yogurt and sour cream base. I used dehydrated onions to give my dip that signature onion dip flavor, and to counter-balance the sweetness of the caramelized onions. I can also imagine cutting back on the dairy (and bumping up the protein content), by pureeing some silken organic tofu in place of 1/3 to 1/2 of the sour cream/yogurt (before adding the onions). I didn't test this, but I'm almost sure it would be good. If you have a hard time finding onion powder (not the same as onion salt), feel free to use crushed dehydrated onion flakes. Just add to taste. In a large thick-bottomed skillet over medium heat saute the chopped onions in the olive oil along with a couple pinches of salt. 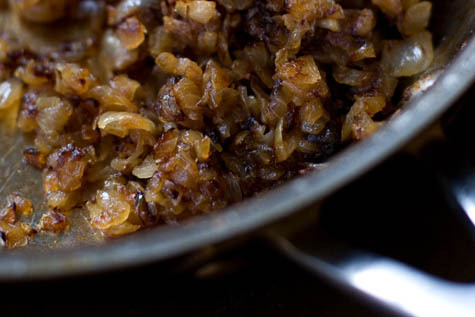 Stir occasionally with a wood or metal spatula and cook until the onions are deeply golden, brown, and caramelized - roughly 40 or 50 minutes (see photo). Set aside and let cool. In the meantime, whisk together the sour cream, yogurt, onion powder, and salt. The important thing is to add whatever onion powder you are using to taste. Add a bit at a time until it tastes really good. Set aside until the caramelized onions have cooled to room temperature. Stir in 2/3 of the caramelized onions, scoop into a serving bowl, and top with the remaining onions. I think this dip is best at room temperature. A favorite guacamole recipe. Served with toasted naan bread (or chips! ), I've added a couple pinches of cumin and curry powder for to incorporate a slightly unexpected flavor profile. An updated, healthier version of my favorite artichoke dip recipe. Artichokes pureed with yogurt, tofu, Parmesan cheese, and garlic and baked until golden.